Formed in 1928 in the thirteenth largest city in Spain, Real Valladolid are also the thirteenth ranked team in the all-time Liga table. Apart from a long absence from 1964 to 1980, they were first division regulars until the last decade, when they have been relegated three times only to bounce back up shortly after. The club’s only major honour was the now defunct League Cup, which they won in 1984. Barça were on a 22-match unbeaten streak against Valladolid, including six games scoring four or more goals at Camp Nou, until a 1-0 defeat at the José Zorrilla put a serious dent in their 2013/14 title challenge, with Atlético Madrid going on to take the trophy. Valladolid were relegated that season, and the only meeting since was Barça’s 1-0 victory on the road earlier this season, Ousmane Dembélé scoring the only goal of the game. 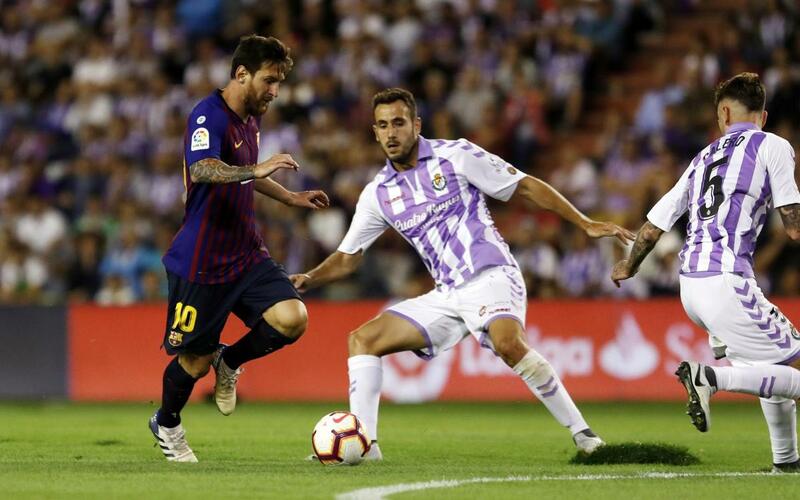 A 4-match winning streak put Valladolid as high as seventh in October, but just two wins in the fourteen games that followed mean they now lie fifteenth, just three points above the relegation zone. With just 19 goals from 23 games, they are the lowest scoring side in La Liga – and their shot conversion rate of 9.8% is also the poorest in the league. That said, they don’t leak too many either, 28 goals conceded being one of the better records in the competition. And be warned, they know how to hold onto a lead. In the mere four games this season when Valladolid have scored first, they have gone on to win every time, a 100% record. The most familiar face for Barça fans will be Jordi Masip, a member of the FC Barcelona first team for several years. And the goalkeeper is having a fine season, being the only ever-present in the side and with a save ratio (73.1%) that is only 0.5% less than former team-mate Marc-André ter Stegen! Left back Moisés Delgado joined Valladolid from Barça B last summer, while Barcelona-born midfielder Rubén Alcaraz spent time at La Masia as a youngster. Enes Ünal, with six caps for Turkey, and Duje Čop with 14 for Croatia are the only players in the side with senior international experience. Ünal is also joint top scorer for the club this season with Óscar Plano – with three goals each. Born in L’Hospitalet on the outskirts of Barcelona, as a player Sergio González was best known for his days at Espanyol and Deportivo and also won 11 caps for Spain. He was appointed coach of Espanyol in 2014 but failed to last beyond Christmas and before joining Valladolid last summer, his only other senior role had been as manager of the Catalan national team.